I think the main point to consider during the Christmas season is the Incarnation, and I would like to share with you some words from Fr. R. Rolheiser. "...of critical importance, is the question of the ongoing nature of the Incarnation. The Incarnation is not a thirty-three year experiment by God in history, a one-shot, physical incursion into our lives. The Incarnation began with Jesus and it has never stopped. The ascension of Jesus did not end, nor fundamentally change, the Incarnation. God's physical body is still among us. God is still present, as physical and as real today, as God was in the historical Jesus. God still has skin, human skin, and physically walks on this earth just as Jesus did. In a certain manner of speaking, it is true to say that, at the ascension, the physical body of Jesus left this earth, but the body of Christ did not. God's Incarnational Presence among us continues as before. ... We are the Body of Christ. This is not an exaggeration, nor a metaphor. To say that the body of believers is the Body of Christ is not to say something that Scripture does not. Scripture, and Paul in particular, never tells us that the body of believers replaces Christ's body, nor that it represents Christs body, nor even that it is Christ's mystical body. It says simply" "We are Christ's body." 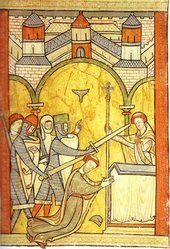 Today, the Church remembers the horrible murder of Thomas Becket, Archbishop of Canterbury, on a cold December evening as he struggled on the very steps of his altar, in his own cathedral in 1170. What was Bp. Thomas' crime in the eyes of King Henry? He defended the rights of the Church against those of the State. Hm. Familiar territory.... This sacrilegious event sent shock waves throughout Europe, people of the time and subsequent history have laid the blame for the murder on Becket's former close personal friend, King Henry II, of England. To have murdered a Bishop in a Church is a ghastly sin, and it's shocking nature rings down through the centuries. I recently blogged on the plight of Christians in Iraq and most of the Middle East, suffering from persecution and violence from Muslim and Jewish sources, supported by international (much of it American) money. While it is true that Christians at all times and places are in danger from the world the death of Thomas reminds us that a Christian, even when safe from Muslims, Hindus, Communists or what not, can be in danger from his fellow-Christians. O God, our strength and our salvation, Who called Your servant Thomas Becket to be a shepherd of Your people and a defender of Your Church: Keep Your household from all evil and raise up among us faithful pastors and leaders who are wise in the ways of the Gospel; through Jesus Christ the Shepherd of our souls, Who lives and reigns with You and the Holy Spirit, one God, for ever and ever. Amen. Today is Slaughter of the Innocents, a day that always creeps me out. I can't imagine the horror those families must have experienced as Government soldiers came in and yanked those young boys from the desperate arms of their screaming parents. How many mothers and fathers also died defending their babies? How many families were shattered by this evil? In those days it was not so very uncommon for politics to be practiced that way. Romans did it in Gaul, the Hebrews did it in Canaan, Herod did it in Bethlehem, the Khmer Rouge did it in Cambodia, Stalin, Hitler the list goes on throughout history. Destroy anyone that can fight back now or in the future and you get peace for your Kingdom or Empire. This is the Kingdom of man, not the God's Kingdom. I wonder, is there a way that we can advance God's Kingdom against the kingdom of Man? 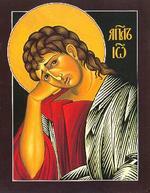 John was one of those "sons of Thunder", who formed an inner circle of the Apostles with Peter and James (his brother). He is mentioned in many of the really powerful miracles that Jesus performed, such as raising the dead, healing the sick, and he even was privileged to behold the Uncreated Light of Jesus' Glory on Transfiguration Mount. In his Gospel, we see that he outran the impetuous Peter on the way to the suddenly empty tomb and was the first of the two to reach it. This experience changed him profoundly changed him forever. He went on to author three Epistles and a Gospel. He may even have written the book of Revelation, though that is less certain. The question I have for is, is how would that change us? Would seeing a person we KNEW to be dead come to life again, would that alter our world view? What would be come less important to us? 1st Day of Christmas, a Christmas blessing. May Almighty God, Who sent His Son to take our nature upon Him, bless you in this holy season, scatter the darkness of sin, and brighten your heart with the light of His holiness. Amen. May God, who sent His angels to proclaim the glad news of the Savior’s birth, fill you with joy, and make you heralds of the Gospel. Amen. May God, Who in the Word made Flesh joined heaven to earth and earth to heaven, give you His peace and favor. Amen. Once again the Seasons of the Church are turning, the Light is here, tonight, for us Christians the Incarnation shall come once more. Unfortunately we rarely talk about the Mystery of the Incarnation except at this time of the year. It truly is a Mystery beyond human comprehension, but I do believe and confess that one night, long ago, the Word was made flesh. That miracle of Incarnation to me, teaches us that we should share in all human happiness and mourn every human grief. 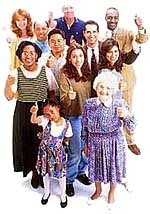 All genuine human joy and contentment is the business of a Christian because it was shared by God, Incarnate. All human suffering, misery, depression, and darkest despair is our concern because Christ walked with us there also. There is no human condition that Jesus did not share with us, apart from sin. This Christmas, I wanted to remember the Christians in the Middle East. Crushed between angry Muslims and an arrogant Neoconservatives, these communities are among the most ancient in the world. They are now suffering more than they have in centuries, if not since the Word was made Flesh and walked among them. So tonight, in the candles, incense, and songs of devotion, as we greet once again, the Lord of Glory, remember His suffering Church! Soon Advent will end and Christmas will come once more. The Darkness of Advent is giving way to the Incarnation, the Light of Christmas will soon be among us. Every year I try to think back to that dark night, a frightened probably very, young woman, her first Child. Darkness, who knows what kind of dangers lurking in an unfamiliar city? As a man, my thoughts often center on Joseph. Trying to help, not sure what to do... Mary crying out in pain, wanting to comfort her, the fears that must have gone through his mind. What if she dies? That was a very common thing in those days. He could not feed the Baby! He had no money to hire a wet-nurse. This dark, scary, smelly scene doesn't quite match our glorious creches enveloped in incense during our crowded, candle lit Midnight Masses. The gleaming Angels and wondering Shepherds are n ot yet arrived. There are no Kings offering expensive gifts. Only Mary, Joseph and pain and the every present Darkness. There is no place in our lives that Jesus hasn't been. From the fear and darkness of that first Nativity, to the heights and Glory of the Mount of Transfiguration. Joesph found that out that night, God was there, all was well, Darkness fled the newborn Light that he cradled in his rough, carpenter's hands. "Jesus - Still Too Radical?" This image moved me. So rarely do we get how shockingly radical and inclusive the Gospel is to those who first hear it. The Apostle Thomas was absent when the Risen Lord appeared to the other Apostles on the evening of Resurrection Sunday. He wasn't about to be swayed by emotional petitions of "Christ is Risen! ", and refused to believe this Miracle until he had seen Him for himself. His story shows us that there is nothing wrong with doubts or with seeking answers for ourselves. How many of us have doubts but for fear of other's disapproval, won't admit or explore them? Thomas did, and more for He did come to Thomas, and from that day forth Thomas served the Lord with all his heart. It appears that he may have ended up as far as India preaching the Risen Christ, for there is a group of Christians (the Kerala district) that claim descent from Christians converted by the the preaching of Thomas. In modern culture so many people see the certainty of American Evangelicalism, while they are wondering about various questions themselves, but don't feel like they can ask most Christians. Can we be like Jesus, open and willing to engage them, without condemnation? Thomas was able to turn to the Lord Himself. He wasn't castigated for his doubts, Jesus simply showed him the Scars on His body. What a simple answer to such a deep need! Maybe we can show others the way to Christ if we share our scars a bit, too. This painting really speaks to me how Jesus would react to our modern doubts. 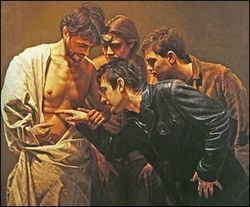 Gregory emulates the style of Caravaggio,using contemporary and realistic figures to show the story of Thomas encountering the Risen Christ. From Fr. James B. Simpson and George H. Eatman's A Treasury of Anglican Art (New York: Rizzoli, 2002). Courtesy of Mr. Eatman. Almighty and everliving God, Who strengthened Your apostle Thomas with sure and certain faith in Your Son's Resurrection: Grant us so perfectly and without doubt to believe in Jesus Christ, our Lord and our God, that our faith may never be found wanting in Your sight; through Him who lives and reigns with You and the Holy Spirit, one God, now and for ever. Amen. So, here in the Darkness a man seeks out a gay man, to kill him. He did it to get a "patch" in the Aryan Brotherhood. He did it for hate. He tied the man's hands with duct tape, and choked him with a wire hanger. And in good, Christian Oklahoma, this is not a hate crime. Why would some one brutally kill someone he didn't even know personally. Why? Because the victim was gay. Yup, that is it, he was a gay man. And Oklahoma sees fit to not add to the murder penalty by calling it a hate crime. Truly this is Darkness. May we make a path for the Lord to come and give us Light.